On Saturday, November 8th, the town of Windsor dedicated it's first "Boundless Playground", at Boardwalk Park. The park is located at 100 N. Main Street, Windsor, CO. This specially-designed boundless playground will provide recreational and educational opportunities for children with and without disabilities. 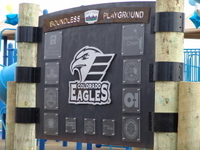 This project has been a cooperative effort by the Town of Windsor, Great Outdoors Colorado, the Colorado Eagles, Hunter's Dream and many other partners. "Breaking the Chain" that prevents play was the goal of the project. A handmade colorful "paper-chain" lined the playground. Together, disabled and able-bodied children "broke" the chain to celebrate the grand opening. Witnessing the children playing, smiling faces, and the sounds of excitement the goal was accomplished! The unveiling of the "Donor Marquee" was truly exciting! "Knowing that Hunter would have loved the playground, made the moment bitter-sweet. I know that's here in spirit with us today! ", said Wendy Nelson. Hunter's Dream For A Cure helped fund the project with a $15,000 Grant, made possible by donations and fundraising efforts. More pictures of the playground can be viewed at the bottom of our "home page" under "Event Photos".